The last major job to finish was the upstairs flooring and baseboard trim and I am happy to report that it is now complete. Our goal was to have it done by Christmas and we finished on December 23, just in time. The upstairs of the house has the master bedroom and bathroom, two dormers, two storage rooms and a large open loft that we use as the TV room. 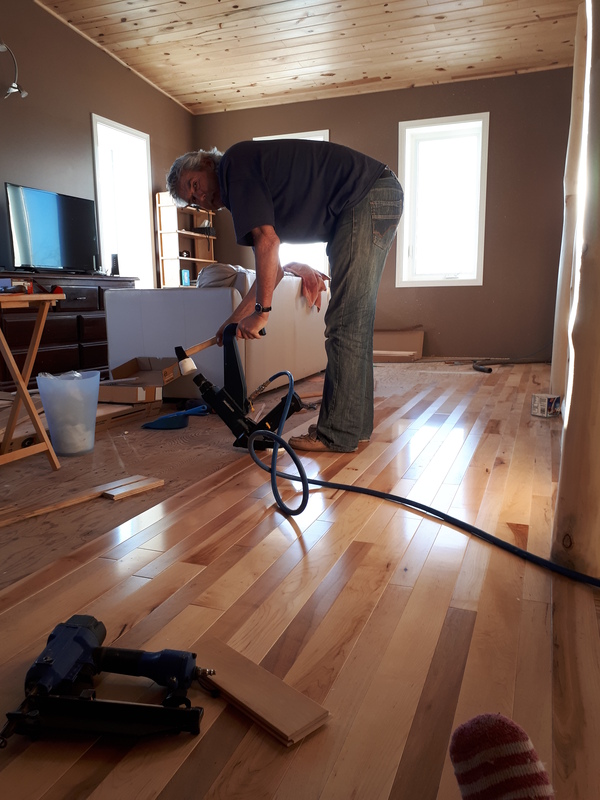 After living so long with plywood floors, it is a real treat to have the flooring in. The master bedroom was completed last spring. The floor in it is prefinished narrow ash hardwood. The bedroom is nice and big enough for a people bed, a dog bed and a cat bed. The bathroom was completed last month. The walk in closet , located between the master bedroom and bath, was completed in the spring. The bathroom and closet both have vinyl flooring. The two dormers have built-in day beds under the window with storage cubbies below the beds. Ken still has to finish off the doors for the storage cupboards and I still need to finish sewing the covers for the day bed mattresses. We also hope to put in sliding barn doors across the front of the dormers so they can be closed off and used as bedrooms for the grandkids (or short guests – the beds are only five feet long) when they visit. The storage rooms, off the dormers, are drywalled but no other finishing done on them. I plan of tackling them in 2018. They will have vinyl flooring. 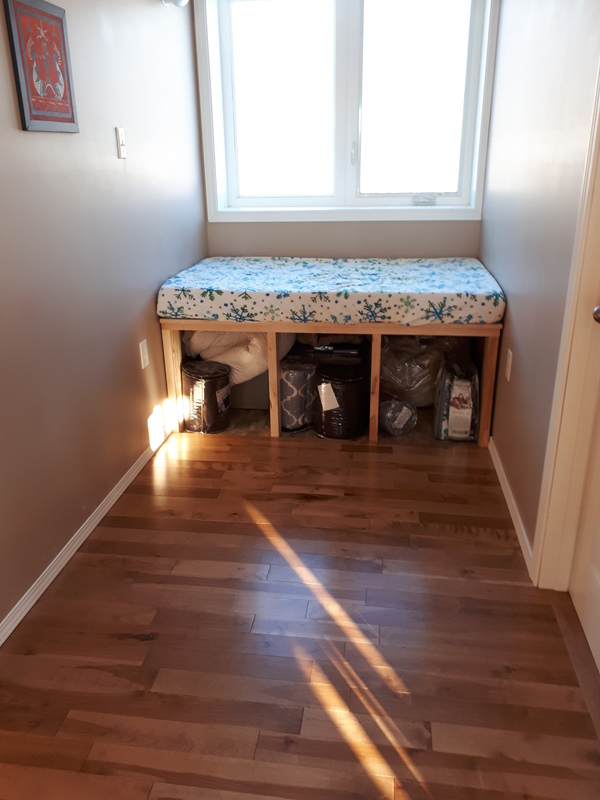 One of the storage rooms is my meditation room and the other I plan to make into a room for the grandkids’ toys. 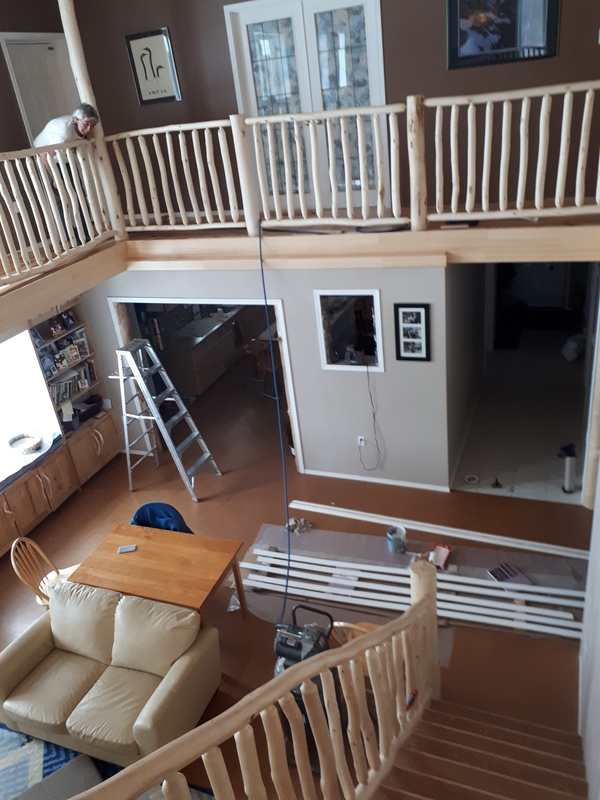 The loft TV room was not in the original house plans; however, the structural engineer did not like where we wanted the outside structural wall to go and suggested we expand to add a loft. We are so glad he suggested it as it turned out to be one of the most used rooms in the house. In the winter, it is warm and cozy with the heat from the wood stove rising, keeping the second floor nice and warm. In the summer, the windows capture the cool breezes and the room is always comfortable. Its a great room for relaxing, watching a movie, reading a book, enjoying the view of the lake or doing yoga. Ken has plans to build an entertainment unit for this room. The floors in the open area of the upstairs – the loft, the walkways and the dormers, are a mixture of hardwoods. 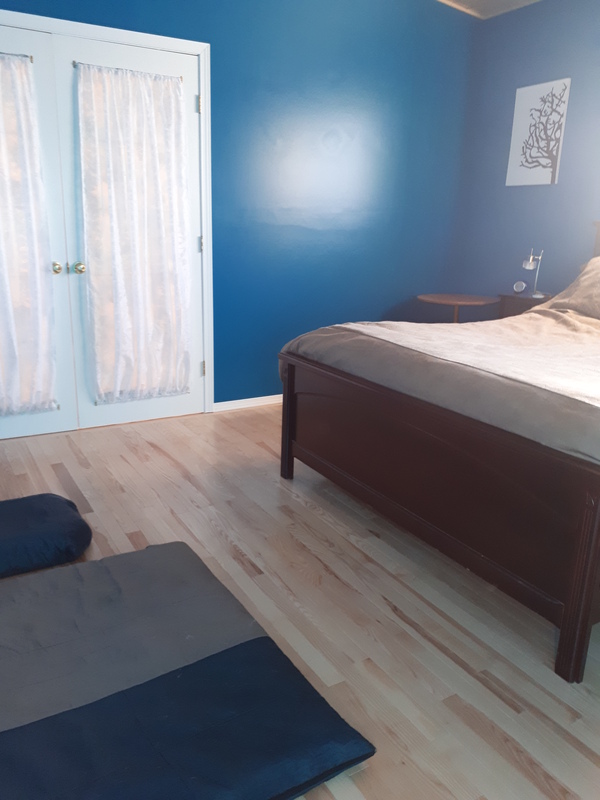 The hardwood was bought in small lots off Kijiji, left overs after reno projects. We looked for lighter colors and ended up with a mixture of maple and birch, some wide boards and some narrow. However, the tongue and groove of all them fit together so we could mix and match. And it was all prefinished so just install and its done. No sanding and finishing thank goodness. Since the area is all open, it was quite a puzzle figuring out how to make it all go together. We decided on a mix of narrow and wide maple, with some birch thrown in as well, for the east walkway. The part of the loft room adjacent to the stairs is also a mix of narrow and wide maple. Where these two meet, Ken did a herringbone joint. The rest of the loft room continues with wide maple. The dormers come off the east walkway and are wide maple which is a bit darker in color. The walkway in front the bedroom and the west windows is all done in narrow maple, meeting in the corner by the door to the outside balcony with another herringbone joint. Considering we used 6 different lots of wood, I think it flows together really well. The installation was a long process, with so many nooks and crannies. Each of the bannister posts needed to be fitted around. As Ken likes to say “It was tricky”. He did all the installation work. 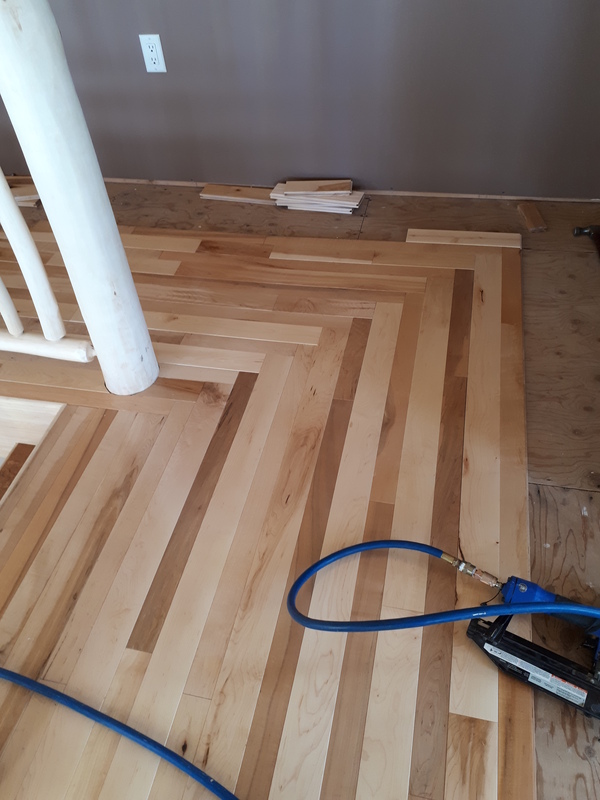 I was the template girl, making all the templates for the bannister posts, arranging all the hardwood in size order and laying out the rows for installation. It is quite a treat to have construction in the house done. I was beginning to consider the pressure tank a permanent fixture in my livingroom. Hopefully this is the last picture of my livingroom being used as a construction site. After almost five years of constant construction, I am happy to say the house is pretty much complete. There are lots of little finishing projects, but those are never ending and will always keep us busy. Its been quite a journey! 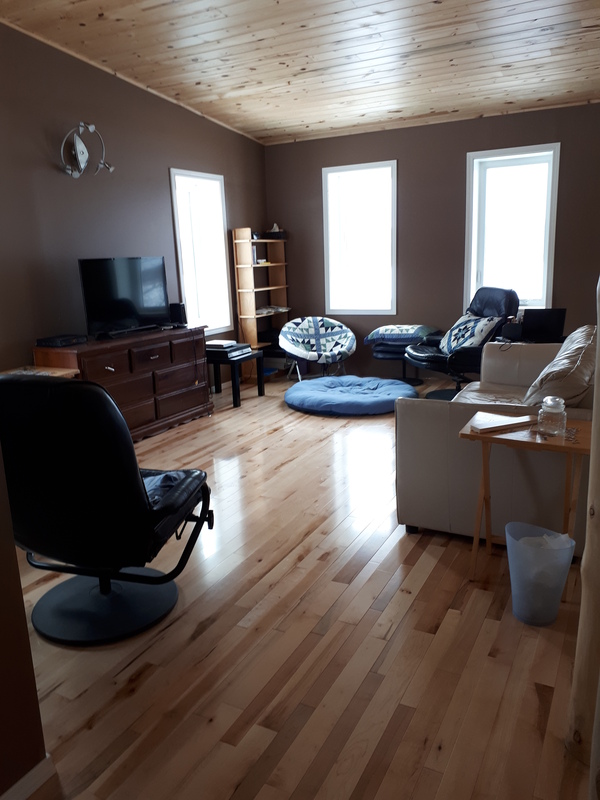 This entry was posted in Bannister, Construction, upstairs and tagged dormers, flooring, hardwood, hardwood floor, loft, media room, TV room, upstairs. Bookmark the permalink. Can’t wait to see it this summer.